Soak the chickpeas overnight. Then simmer in fresh water for 1 hour, until tender. Preheat the grill to medium. Toast the seeds under the grill until they release their scent. Grind with a pestle and mortar or a mill. Fry the onion and carrot in the vegetable oil for 5-7 minutes. Add the chilli, garlic, ground spices, cooked chickpeas, turmeric and ginger. Fry everything together, using a little more oil if necessary. Add the cashews and almonds, stir, then add water to barely cover. Bring to a simmer then keep on a very low heat for about 25 minutes until the almonds have thickened the curry. Add the spinach and peas (if using) and cook for 5 minutes. Season with salt and lime juice, add the coconut milk and half the coriander. 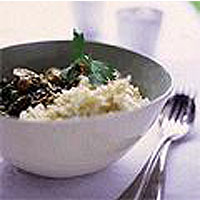 Sprinkle the remaining coriander on top and serve with coconut rice and mango chutney.